This is part three of an ongoing series by our latest guest editor, NASA's Phoenix Mars Lander, as it faces its final days. As a polar explorer, my entire mission depended on ice. 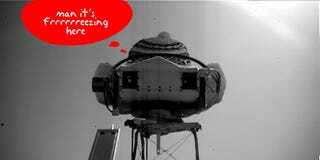 I was sent to Mars to find clues to the water history of Mars-data that would help determine whether the planet was ever hospitable to life-by studying its water ice. Without it, my mission would be toast, but in the end, it's what will ultimately kill me.Using data from the Odyssey orbiter, scientists predicted I'd land on top of subsurface ice, completely hidden from view below inches of red Martian topsoil. It would probably take a few to several days, maybe even weeks, of tireless digging with my robotic arm to find it. Or so they thought. Before I could dig, I first had to check some blind spots around my base that were hidden from the view of my main camera. Engineers wanted the smaller camera on my robotic arm to check under the deck and around my footpads to be sure there weren't any large rocks that could be an obstacle to the moving arm. In one of the great serendipitous moments of the mission, my peek underneath showed solid patches of what appeared to be exposed ice. The blast of my retro rockets during landing had blown away the topsoil, revealing what I'd come for. In the mission downlink room, where the teams gather to watch my images coming back, scientists and engineers did a double take at the computer screens. People jumped. Someone yelled "holy cow!" The phrase stuck and became the name for the patches. It was only five days into the mission and already it was off to a wonderful start. A few weeks later, with digging underway, scientists stared at their screens again when before-and-after images showed small chunks had disappeared from a trench. It was another sign they were waiting for. The vanishing act could only be explained as sublimation, the transformation of a solid to a vapor, and additional proof I'd uncovered ice. As my mission progressed into late summer, I saw a Martian sunset for the first time. It was a beautiful sight, but also a chilling one. Losing the midnight sun meant less energy for my solar panels. It also meant colder temperatures and eventually the need to run heaters to keep myself warm enough to survive. The combination of generating less power and needing more power to stay warm was expected – and deadly. 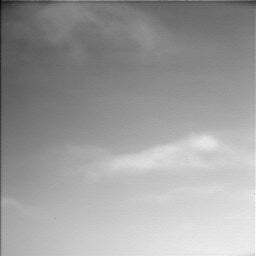 On the last day I conducted science, sol 151 (Oct 27), a perfect storm converged. A combination of ice clouds and a dust storm had darkened the sky, causing a dramatic drop in sunlight reaching my solar panels. As I worked to finish my final science operation of the day, power levels reached a critical point. To make matters worse, temperatures dropped to the lowest point of any time in the mission, and the heaters kicked in for the very first time. With that, my last bit of power drained away. This is my "telltale" blowing in the storm's strong winds. Thankfully, my systems are built to automatically attempt to jumpstart my heart again, should my batteries begin to receive power again. This is my Lazurus mode (I've used up just about all of the life-after-death metaphors!). On a few recent days since the storm, my Lazarus mode has brought me back to life when sunlight hits my panels, giving me enough energy to send a beep to an orbiter before I lose power again. The cycle repeats and could go on for days. But it will have to stop, one day. And I fear that day is coming up sooner than later. My instruments, including a miniature chemistry lab, an oven to bake samples and analyze their vapors, an optical and an atomic force microscope, a laser (which discovered the snow), and a weather station worked valiantly throughout the mission and sent back enough data to keep the scientists busy for months, if not years, to come. My scientific work here may be done, but I'm still alive. And my story on Mars is far from finished. You can find Phoenix Lander's previous Giz entries here and its Twitter feed here.